It's hard to remember the score in tennis, especially after a long point which distracts everyone. 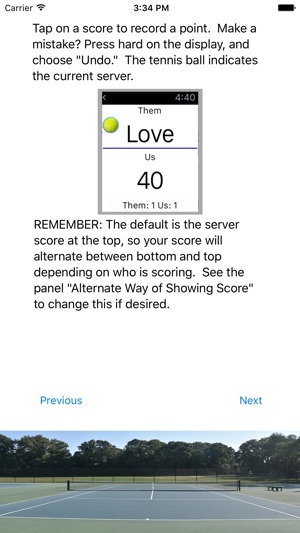 Use WatchPoint to keep track of the score on your Apple Watch as you play. WatchPoint keeps track of the game score, number of games and sets won. Start WatchPoint, select the number of sets you intend to play, and hit play. Tap on the winner's score after each point to add that point to the score. Watchpoint displays the score in brilliant large type that's easy to read, even in direct sunlight. Hit the wrong score? Just do a deep press on the watch to bring up the Undo menu. Watchpoint also allows you to adjust the score if you lose track. 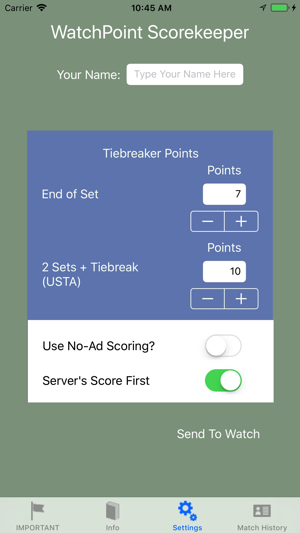 If the end of the set is tied, you get to choose between scoring using normal win by two or using a tiebreaker. There's even a setting for no-ad scoring and to adjust the number of points for a tiebreaker. Important: Before you start using WatchPoint, open the Watch App on your iPhone, and go to General->Wake Screen. Under "On Wrist Raise," select "Resume Last Activity." This prevents the Watch from terminating WatchPoint while you're playing. WatchPoint orients the score so that when you raise your wrist, the nearest score to you is your score, and the farthest score is your opponent. A tennis ball badge indicates the current server. No more arguments, bad feelings, and wrong scores. For the cost of a can of balls, you can keep the score right on your Apple Watch. A new history view on the phone displays a record of every set you play. 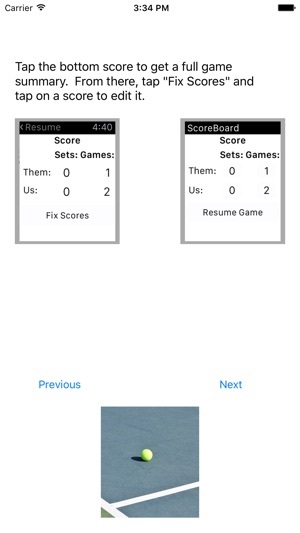 On the score display, your opponent's score has a cowl to quickly tell which score is yours when server score is first. Various optimizations and improvements. 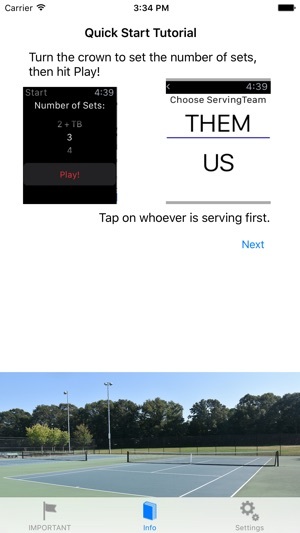 Easy to use app for all my tennis matches. Great tutorial and excellent use of the Apple Watch. I'm always forgetting the score when playing, and this helps keep everything accurate!